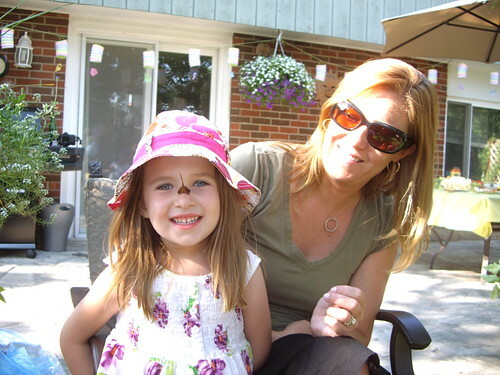 A Canadian in Japan (let's just pretend this isn't a mommy blog). 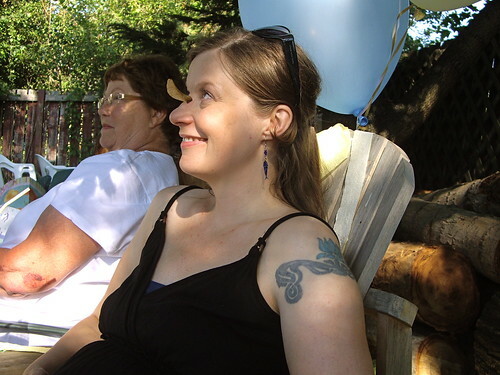 During my trip back home earlier this summer (read Part One here) my belly received plenty of attention, and everyone got to feel the baby move (and hiccup, which it does daily) at least once. I also accidentally cured one of the minor pregnancy woes that had been waking me up at night for a few weeks. I'd been having leg cramps and noticed that they disappeared after I arrived in Canada, and suspected it was because the super-soft and comfy down mattress topper that was on my bed in the guest room, and maybe also the very big fluffy pillow that I was putting between my knees to help with my lower back pain (as opposed to the firm latex foam mattress and hard pillows I have at home Japan). I didn't have "proof" until I was moved to another bed to make room for more guests. It turns out that an air mattress, even a really good one, is just as bad for leg cramps as a foam mattress. The cramps improved when I added the down topper to the air mattress, and completely disappeared again as soon as I was back on the down topped-regular mattress. And back home in Japan, with a brand-new fluffy mattress topper on top of our latex mattress and a rolled-up sheepskin between my knees replacing the pillows I used to use, my leg cramps haven't returned. I'm guessing that the mattress topper and sheepskin allow for better circulation, and simply by changing my bedding I've cured something that no amount of stretching or walking was able fix. So as a public service to any pregnant ladies out there suffering from leg cramps: change your bedding! If you don't have a soft mattress that allows for circulation get a mattress topper, and if you sleep with a pillow under or between your knees change it to something fluffier. Anyway, back to the trip home. 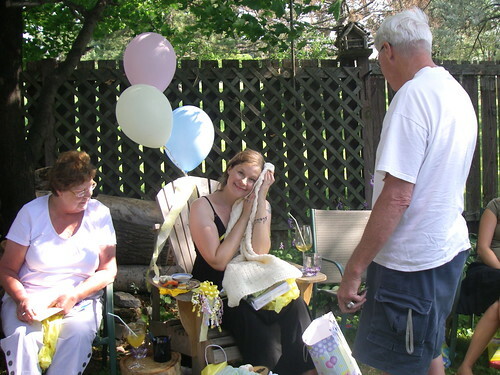 The main reason I'd been invited back home was for a baby shower, which my mom threw in our backyard. 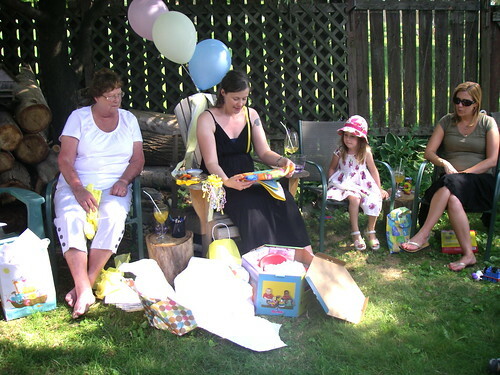 It was a beautiful day and it was wonderful to see everyone and they all brought lovely presents that were both cute and portable (as I'd have to carry everything back with me), and I wish I could show pictures of the loot (but I won't because that seems wrong somehow).But I treasure it and already have it packed away in the baby's dresser and I can't wait to start using it all. 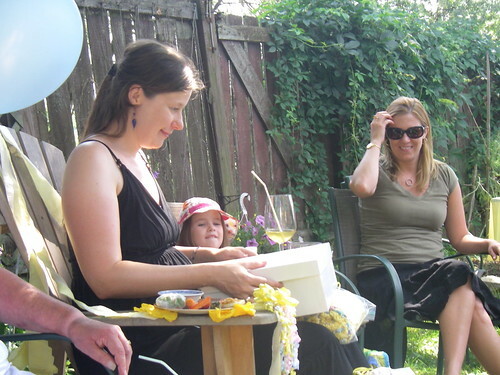 I was busy being the guest of honour (OK, technically I'm merely hosting the guest of honour) and opening presents so didn't take any pictures, and pretty much all of the pictures other people took were of me. So please bear with me for a while, and to make up for all the me pictures I've included some cute kid and sister pics as well. 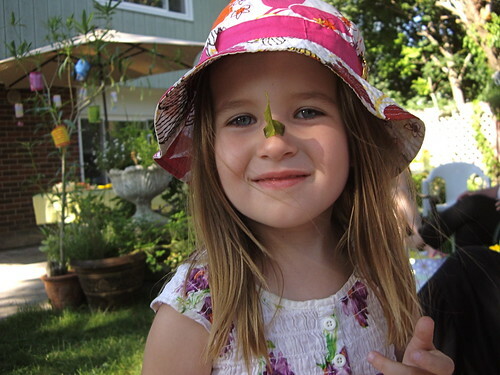 Maggie learned how to make a maple seed into a rhinoceros horn, and did it more cutely than it's ever been done before. 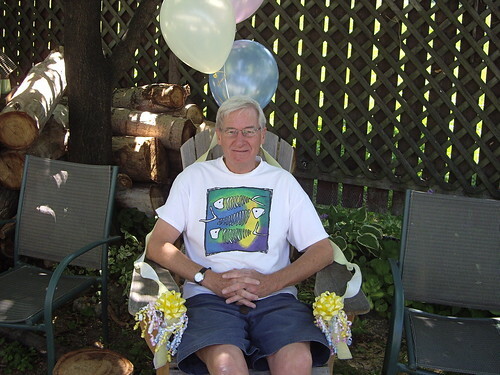 My Dad got back with the other menfolk near the end of the day, just in time to grill some burgers for us. 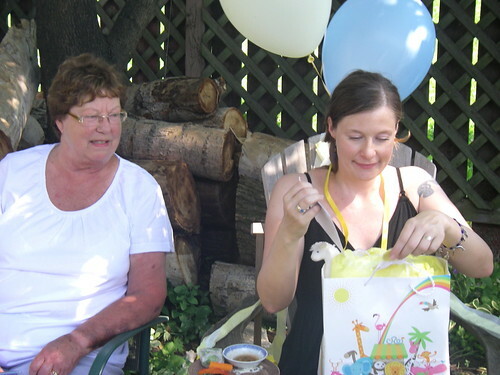 It was a wonderful day and I very much appreciate that people came and gave nice stuff to the baby. 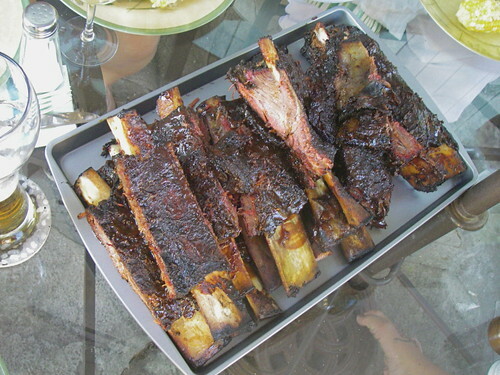 The next day my brother Greg took over the grilling and did his famous beef ribs. 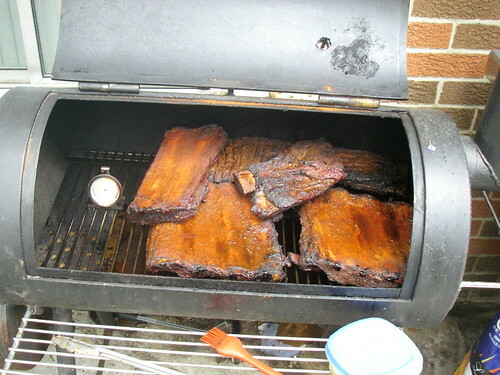 He'd been smoking them for a few days and by the time they got to the table they were smokey, soft, and delicious. After all of his hard work it seems a bit mean to post this sign, but what the hell. The sign was miraculously discovered in near-perfect condition behind the sink during a recent bathroom renovation and kept for historical and/or humiliation purposes. It dates from nearly three decades ago, when Greg was a little kid, and was written by my sister Julie (who doesn't remember writing it but recognizes her handwriting). 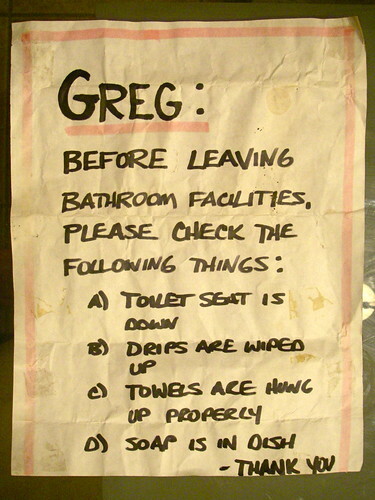 To be fair, Greg claims it was all a case of mistaken identity and that the real culprit in the apparent messy bathroom crisis was our dad. To be even more fair, I can imagine that every single bathroom used by a male member of the species could use a sign like this. Julie, who is probably a little more laid back about bathroom cleanliness these days, having raised a son of her own, joined my Dad and I on one of our morning walks. 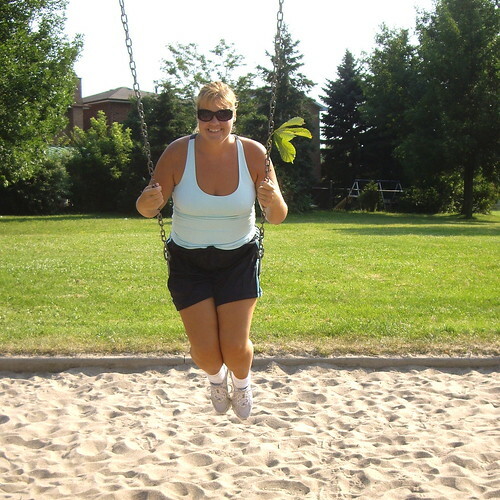 We stopped at a park for some swing time, and I discovered something: if you're pregnant, swinging can be a major workout. My mom took all us kids out for dim sum one day at a local place called Kingsley Chinese Restaurant. We have good Chinese food in Japan, but not really any proper dim sum places, so this was a big treat. At the bottom of the above plate is one of my favourites, which I identified as radish cake but was corrected- the trolley lady called it turnip cake. I've always thought it was made with daikon or radish (it's called daikon mochi in Japan) so am now a bit confused. 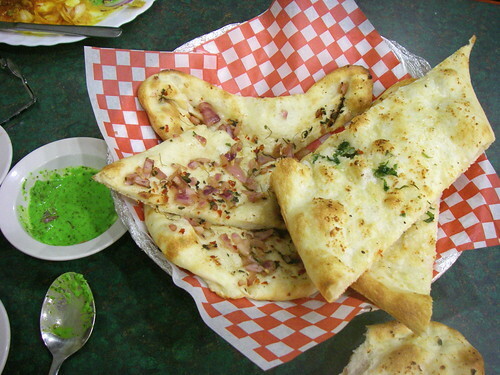 Anyway, it turns out that everybody hated it, so I had to eat the whole order (a plate of six giant pieces) by myself. How can anyone not like daikon mochi/turnip cake? We finished with egg tarts and the mango pudding above. 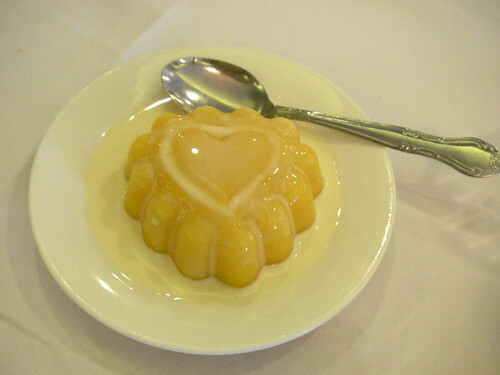 I always avoid mango pudding as I assume, since I don't like pudding, that I won't like it. But it's nothing like regular pudding at all! Now that I know what I've been missing, it's my goal to eat as much mango pudding as possible. I had really been looking forward to some fruit picking and jam making, but backed out of a trip to Niagara to pick cherries (I was tired and suffering from leg cramps and figured I shouldn't be up in a ladder in my delicate condition). So I just helped with the jam making. 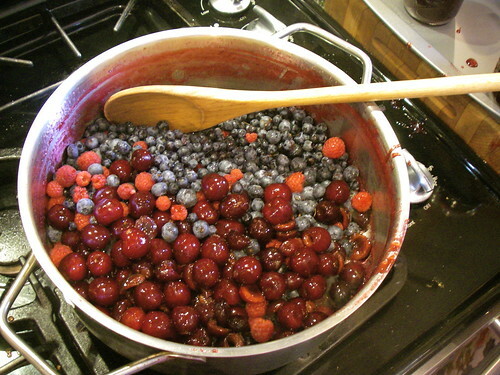 We made batches and batches of plain cherry jam, and one batch each of cherry-rhubarb and cherry with mixed berries (wild and farmed blueberries, farmed raspberries, and some raspberries from our garden, all added to stretch out the last of the cherries), above. 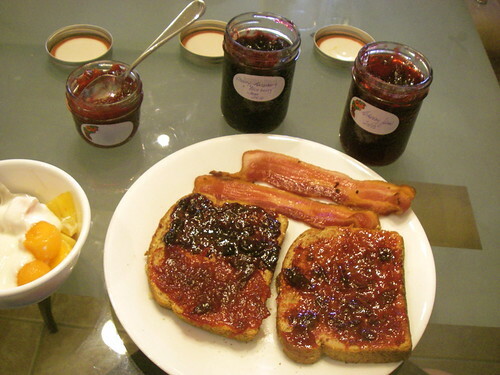 The next morning a taste test showed that they all turned out deliciously, although the jam with the mixed berries didn't set (we were out of pectin by then so it wasn't a surprise). On another day my Dad took Julie and I out for Indian food at a place called Village of India, which does a very good and cheap vegetarian buffet. 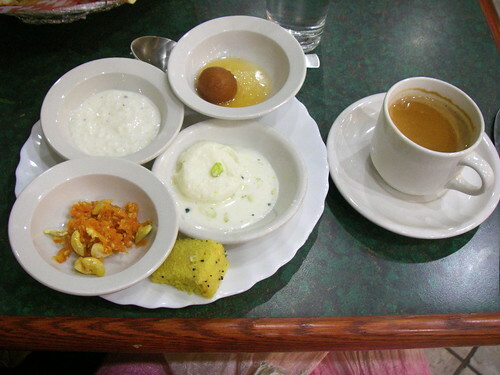 My sister is far more familiar with Indian food than we are so I got to find out what everything actually was, and I tried all of the desserts for once (usually Indian desserts kind of scare me, as the ones I've tried were super sweet). They were indeed sweet, but in a very soothing way after the spicy food, and with hints of herbs and spice and honey. Unfortunately Indian restaurants in Japan tend to have a very small dessert selection, if they have desserts at all, so I'll probably have to wait until my next visit home to try more. 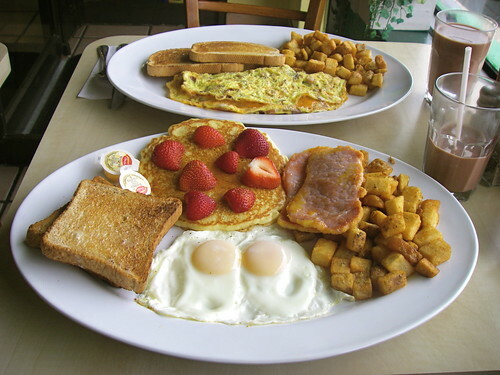 Near the end of my visit I met my friend Aspasia for brunch at a nearby breakfast place called Flips. I thought the prices on the menu seemed a bit high, and then my food came and I realized that a single order is actually about the size of three meals. It was tasty, especially the prefect home fries, and I'm really going to miss breakfasts like this here in Japan (and knowing this would be the last such breakfast in a long time, I managed to eat almost everything on my plate). 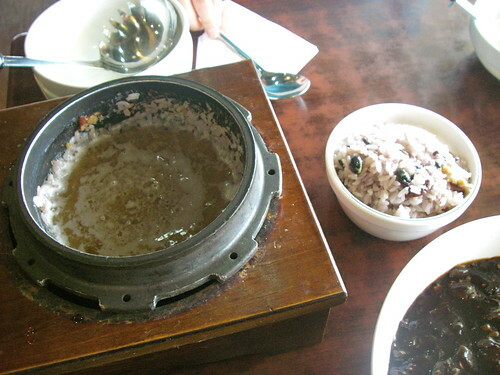 Sherry, my brother's girlfriend, took to lunch at Man Doo Hyang, a Korean restaurant in Mississauga. It was really interesting seeing how Canadian Korean food, which seems to be more authentic, differs from Japanese Korean food. 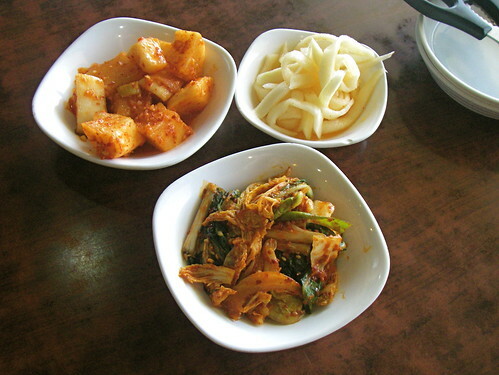 One big difference in Canada is the free banchan (kimchi and other little side dishes), above. Sherry had a few questions about the different kinds of dumplings, so we were brought a small plate to sample. 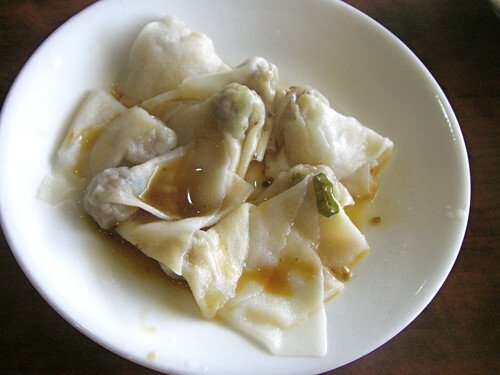 These are called "Boiled Chinese Style Dumplings" and seem to be a cross between wontons and what's known in Japan as suigyoza (boiled gyoza dumplings). 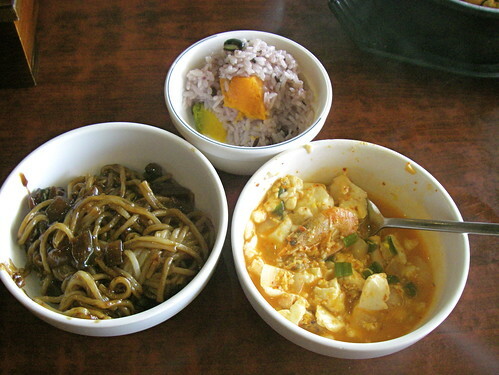 We finally decided to share jajangyeon (identified as Korean Style Handmade Noodles with Black Bean Sauce) and soon dubu chigae (spicy tofu and seafood soup), which came in a hot stone bowl with a raw egg (to be added just before eating) and pot of rice on the side. 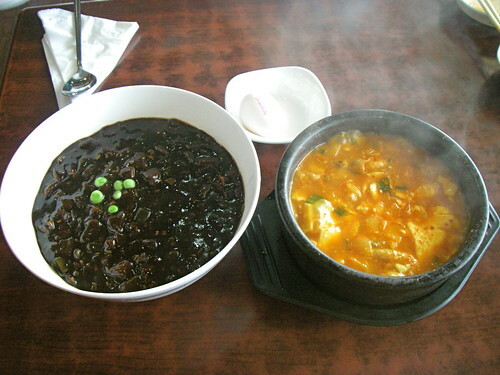 I had expected the jajangmyeon to be similar to Japan's jajamen (both being based on a Chinese dish) but was surprised to see it was quite different. The noodles were chewier than the udon-like noodles used in Japan, and the sauce was much darker and tasted strongly of black beans (Japanese jajamen uses miso and ground pork). It was tasty, as was the chigae. The rice that came with the chigae was cooked with black beans, kabocha squash and sweet potato (and maybe some chestnut too, can't remember). After scooping it into bowls I was looking forward to eating the crunchy bits that stuck to the pot, but then the waiter came and filled the pot with boiling water! I figured he'd done it to get a head start on washing the dishes and was outraged that he'd ruined our rice, but Sherry assured me that adding hot water to crusted rice is normal and we were to eat it as a soup. So I tried some, and almost liked it. It started off well, with that lovely nutty burnt rice aroma, but then on tasting it had a flavour of... nothing. Apparently this is a wildly popular thing to do with rice in Korea, but I guess you have to grow up eating it to really appreciate it. I'd rather have the un-soaked crusty rice any day. Except for the rice water this was a very tasty- and highly educational- meal and I hope to go back some day. After lunch we stopped at a Korean market and Sherry bought ingredients for miyeok guk, a special soup served to pregnant ladies and nursing mothers. 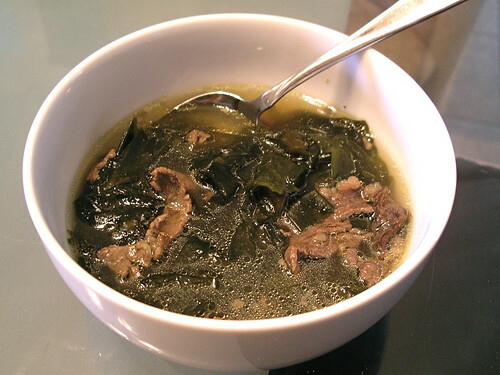 It is a simple but very delicious soup made with wakame seaweed and beef, and the version she made was excellent. This is one of the rare new foods I discovered back home that I can recreate here in Japan, and I'll be trying it soon. My last lunch out was at Rapinis, a local Italian restaurant, with my mom and dad. 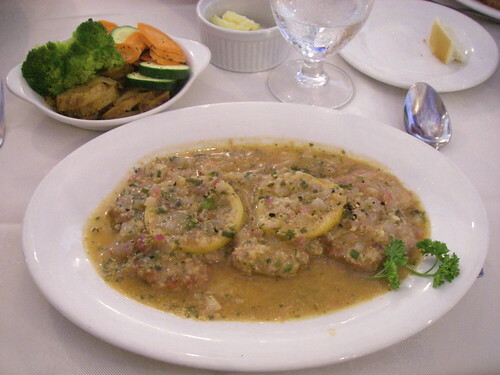 I had veal picatta, the first time I've had veal in ages (having long considered it cruel). It was delicious, but not substantially more delicious than any other meat, so I can now happily go back to not eating veal for a few more decades. 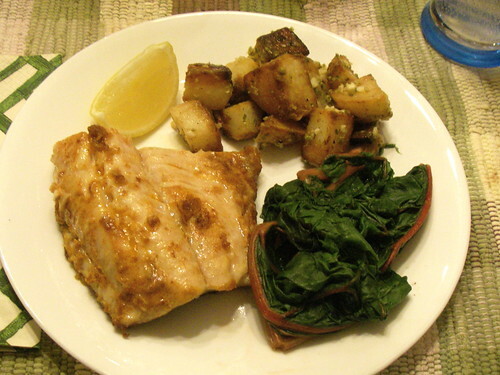 And my last dinner was pickerel, a local fish that I love and had really been hoping to try while I was home. We hadn't been able to find it until my last full day, so I made my mom buy it and cook it up for me. 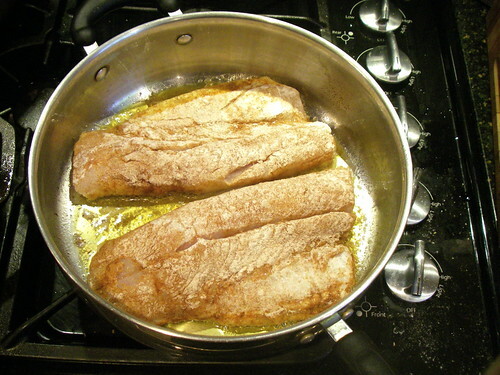 She dredges it with flour and paprika and fries it in butter, which is one of the best ways to do fish ever. Served with roasted potatoes and Swiss chard (which I also made my mom make, since I've never tried it before- sadly I was the only one who liked it). A wonderful last supper. The good eating continued on the flight home. 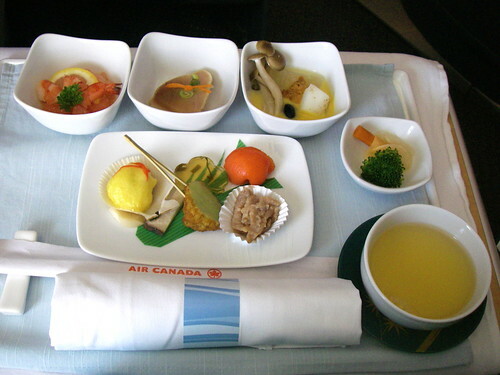 My mom had cleaned out her air mile savings to get me seats in Air Canada's executive class, which of course was wonderful. As with my flight in, I chose the kaiseki dinner, and was again served several tiny dishes of lovely tasty things. 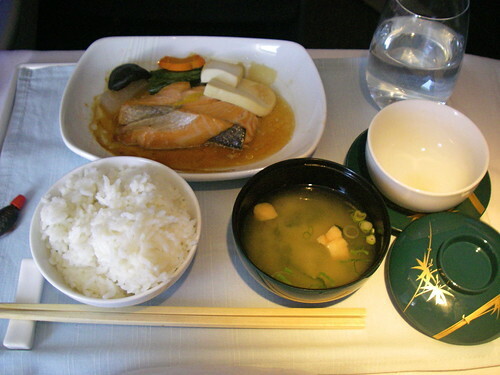 Again, the little dishes were better than the main course, which this time was salmon with tofu and vegetables, served with rice and miso soup. But the salmon was quite tasty and only fared badly because the first part of the meal was so good. 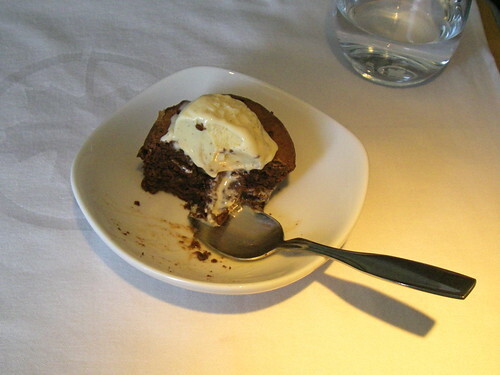 For dessert I had the molten chocolate cake, which wasn't quite molten but very, very tasty. 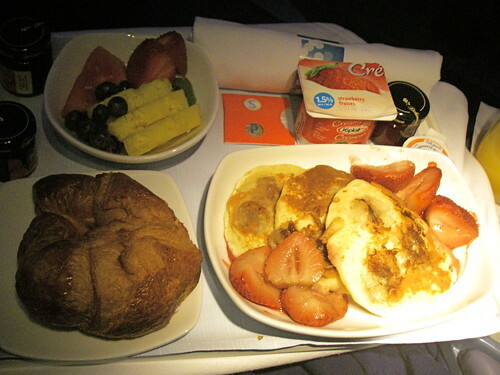 This time I didn't sleep much, so I was awake for a mid-flight snack. 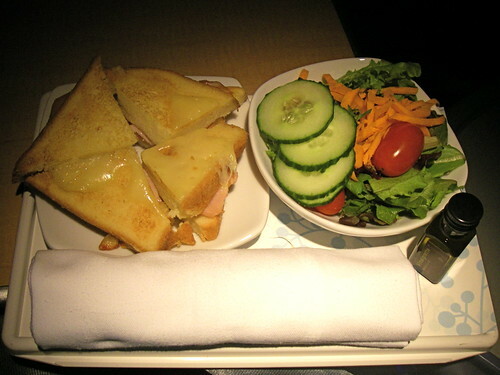 Out of several choices I went with a croque monsieur and salad, and was amazed that the sandwich was freshly made from scratch- this was definitely the best airplane snack I've had. The Japanese first class passengers all seemed to have instant ramen for their snacks, which I find hilarious. Hideaki said it must be because wealthy people never eat stuff like that so it's kind of a treat for them, which makes sense but doesn't make it any less funny. For breakfast I had banana pancakes with strawberries, which came with fresh fruit, yogurt, a nice flaky croissant (but not as good as the one I'd had on the way over- not surprising since Japan does pastry so much better than Canada), two little jars of jam and a jar of real maple syrup. Sorry for the lighting: the sun never sets during the entire fourteen hour flight so we had to keep the windows covered at all times, and they keep the lights low for most of the flight as well. This is great for sleepers, not great for taking pictures of food. I was a bit reluctant to get off the plane, knowing it would probably be my last time ever in first class, but I eventually disembarked and entered regular life once again. On the bus home I rediscovered what discomfort is and found myself wondering why airport buses don't have a first class (but even if they did I'm pretty sure my mom doesn't have any surplus bus miles to share). 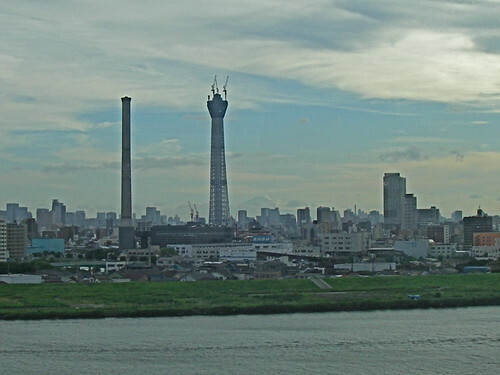 I did get some neat views of Tokyo Sky Tree, the new tower currently under construction in eastern Tokyo, shown above with the Arakawa river in the foreground and Mount Fuji (you have to look really hard) behind it. And then I was back home, tired but very happy to see Hideaki and eager to spend a final two months together as a couple. See more pictures from the trip here. 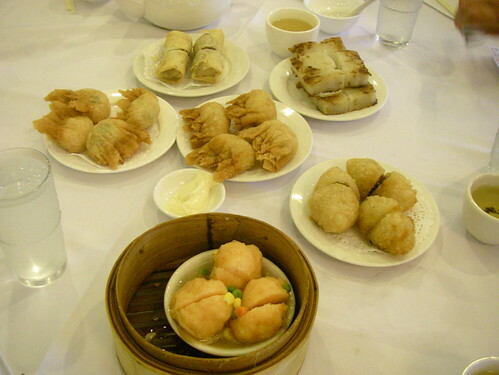 We just went for DimSum on Sunday. What are those football shaped ones? They are kind of Chewy but soft and filled with pork? I love those but never know the name. I love Turnip cake too, but my husband is not a fan. I have to eat the whole plate too! Oh Darn. Wow, you do eat well! Hi! I've been reading your blog for about a year now and I wanted to say I really enjoy it. I'm from Brampton myself (currently living downtown in Toronto though), and have visited Japan 3 times in the past few years. Getting to see your perspective on the differences between the two, and how you've adapted your lifestyle to fit has been enlightening and helpful to me as I make my own future plans. Your visits home--to settings that are generally familiar to me--are particularly illuminating. Thanks for all of the effort you put into this blog, I (and probably lots of lurkers like myself) really enjoy it. 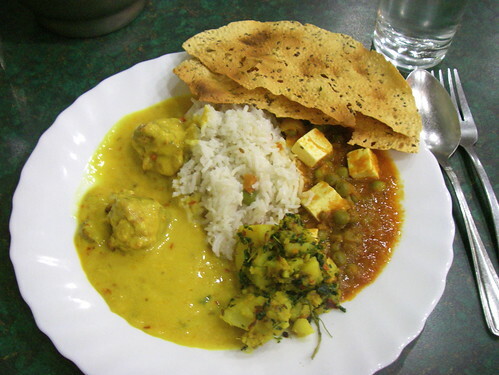 Wow, such a variety of different cuisine and mouthwatering pictures! Yeah, as a Chinese from Hong Kong, I can tell you that the "turnip/radish" cakes are in fact made from something very similar if not identical to Japanese daikon radishes. However, for some reason it tends to get translated as "turnip cakes". Perhaps because the usual western "radishes" are the small, typically red ones while "turnips" at least look more whitish like daikon? 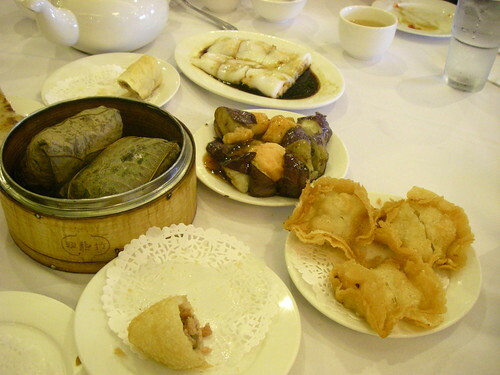 @Christine: take a look at http://zh.wikipedia.org/zh/File:Xianshuijiao.jpg and see if that's the football-shaped dim sum you had. Or is it more like a steamed dumpling? 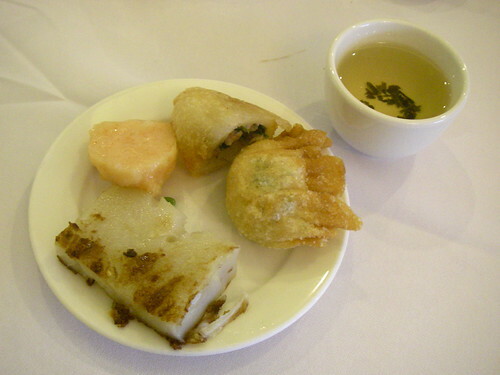 Turnip cakes are made from daikon which are known in other parts of asia as chinese radish, etc. It's known colloquially as "turnip cake" but the lady was wrong, it's really made from daikon -- I make it myself at home. The cantonese name is "lo bak go" (sorry my pronunciation and thus spelling is terrible). There's variants on it, including a lovely taro version, and it's definitely one of my favorite dim sum dishes :) Having to eat an entire dish at one go like you had to though would be a bit too much, delicious as they are! What a lovely post about your trip home. Nothing beats eating your way around where you came from. I do the same when I return to Singapore. And who would've thought bedding was the culprit for leg cramps?! 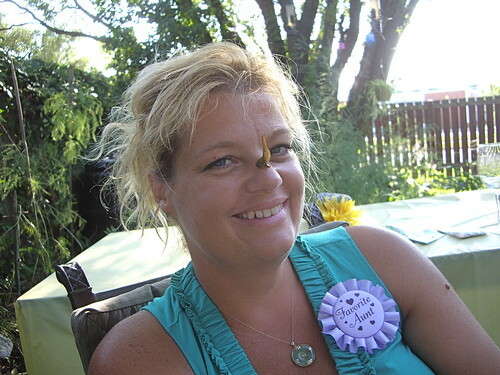 I've always loved your blog, but it's just escalated to adoration in light of those rhinocerous photos! My friends and I used to do that as kids, and had hours of fun, but I always assumed it was a north-east English thing. This post has aroused so many blissful childhood memories, so thankyou! And you're looking so beautiful, congratulations. 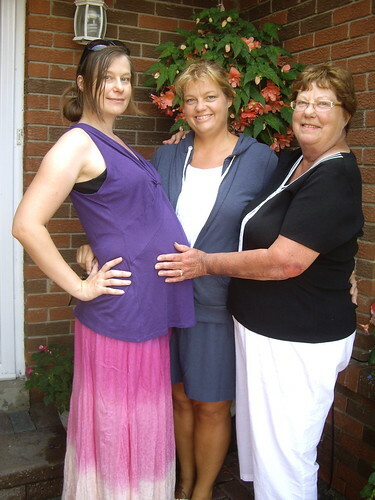 Pregnancy suits you! Christine, I think CB is right and they are xian shui jiao. I love them too, that combination of crisp, chewy and soft is wonderful! Thanks Terri, CB, and Anna for the turnip/radish info. I also hate using "radish" for daikon, as it's not really the same thing, so can kind of understand why "turnip" is used. Maybe I should just call these cakes "lo bak go". Thanks Christopher. It's always nice to hear from a fellow Bramptonite! CB, thanks for helping to solve the turnip cake/deep-fried football mysteries! Anna, yes- one or two pieces are lovely, but it's really hard to finish a whole plate. By the time I was done I was almost agreeing with everyone that "it has no taste". Astrorainfall, I bet you eat really, really well when you go home to Singapore! I'd love to go someday. Anna Lisa, thanks! You're the first person I've met who knows the rhino horn trick. Maybe it really is a north-east English thing and my ancestors brought it with them centuries ago when they came over from Britain. I've tried to teach people in Japan how to stick maple seeds on their noses but they're never impressed and always ask "but why?". An amazing number of Japanese kids also don't know that maple seeds twirl like helicopter propellers when dropped.